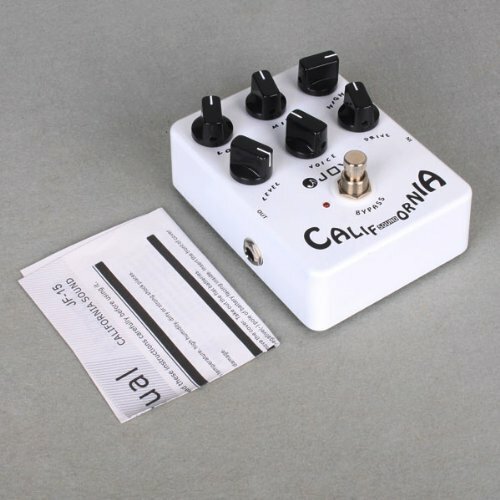 CA style from a Joyo Pedal is what you'll get from the JF-15 California Sound distortion pedal from Joyo. The modern rockers all prefer high-gain lead and rhythm channels, and the JF-15 circuit was designed to replicate the sound of these incredible amps. Gleaming with sparkle and smooth saturation, just like a modern tube amp from Mesa Boogie, Orange or Diamond, the California Sound will work its way into your pedal chain for good reason. Sound! The features on this distortion pedal really provide flexibility and sweet various sounds. Used for rhythm work suitable for punk and rock-rap, this pedal needs only ½ gain from the drive channel; you can scoop the mids and allow just the brightness and balls to ring out; you can use it as a low-pass filter (cut mid and high 100%) on a bass or even process vocals with it (as a sidechain via reamp or even live) for a tight, unique effect. With the Output near max and Drive backed off a bit it provides a really smooth, subtle overdrive (used as a clean boost to get just a bit more sparkle out of an old Champ-style tube amp). The JF-15 is as groovy and as funky as a chili pepper, with the attitude and focus of the "rude-boy" Omaha hero free-form rockers.. can anyone guess it? Yeah, that's right: 311! ;) If you know rock guitar of the 90s, early 2000s and beyond, then you know and can appreciate this sound.